I did steps #1 through #4!! I'd love to win because I'm a big fan of your dvds, but with 2 kids (and one on the way) i sometimes can't get to a tv to do a workout. with the book, i can bring my kettlebell to the park and follow along with the book. hopefully i can inspire someone else to pick up a kettlebell! I follow your blog and "liked" you on facebook. I would love to win because I desire to learn more about kettlebells. I used them after my 2nd child, and during my pregnancy with my 3rd. One of my good friends is someone you featured on your blog a little while ago. She got me into them. With three kiddos, I need more ways to exercise when time is short. I am a runner, but use kettlebells for my strength training, and love it! 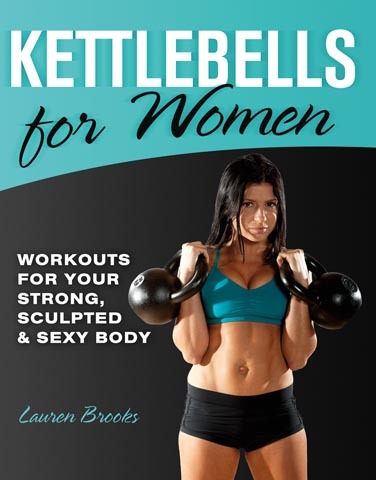 Ever since my hysterectomy I've been looking for something to help me feel like a woman again and the more I see women doing kettlebell workouts the more I think that this is exactly what I need to get confidence as a strong, empowered woman. I have been looking for a more time friendly exercise program. I am a homeschooling mom of 4 children and don't have a lot of extra time in my day. I would love to try one of your DVD's. I'm also following you on Twitter! I'm following you on twitter and liking your fb page. I want to win the whey protein ( already have the book and luv it ). I am already a fan on FB. I love you're articles and I would love to win your book for my wife, who gave birth to our 4th child last year and has decided to join me as an HKC instructor because of the changes she's seen in both or our physiques. I'm so proud of her and want to continue to encourage her. I'm so glad you were able to help me when I emailed you, thank you again. I will keep you updated on how it's going. I would LOVE to win your book! I think it would really help me since I just started using your DVD. I want to know as much as I can, plus I wouldn't have to annoy you with all my questions lol. Thanks so much for this awesome giveaway!! And I'm here cause I'm fallowing your blog. Thanks for the giveaways!! You are so generous! I have been a follower of your blog and FB page for over a year now and love all the information I have learned from following you. Love your DVD's! I have been struggling with thyroid issues and the inability to lose weight for a while and although I still am unable to lose weight I have certainly toned up and am feeling stronger thanks to kettlebells. I have recently started to try to clean up my eating and have been making some of your smoothie receipes and love them! Would love to learn more about the other nutritional products you sell on your website. I started following you on Twitter, I liked your page on FB, and shared this post on my Google+ page. I also subscribed to your newsletter - is that the same thing as following the blog? I don't use google friends, but if you put up an RSS feed for posts, I'd gladly follow using my google reader! I'd love to win because I became acquainted with kettlebells in the past few months, but just recently realized that I think I've been using bad form. I *love* working with kettlebells so far - I've always wanted to be strong, not just skinny. But, I think I could really hurt myself with bad form, so your book would be PERFECT! In short, I'm in it to win it! As a new KB inductee, I am enthralled with the results and strength that KB bring. It's great seeing a woman promoting good health (diet) as well as a VERY strong body! i liked i shared i tweeted! Great stuff. I am a big fan of kettlebell training. They are a great tool for keeping motivation levels high by varying workouts. Best of luck with the book, I will be checking it out myself.